Sharon Jones (1956-2016): A Queen Among Kings : The Record The fiery singer, whose work with The Dap-Kings helped inspire a soul revival, died Nov. 18 after a long battle with pancreatic cancer. 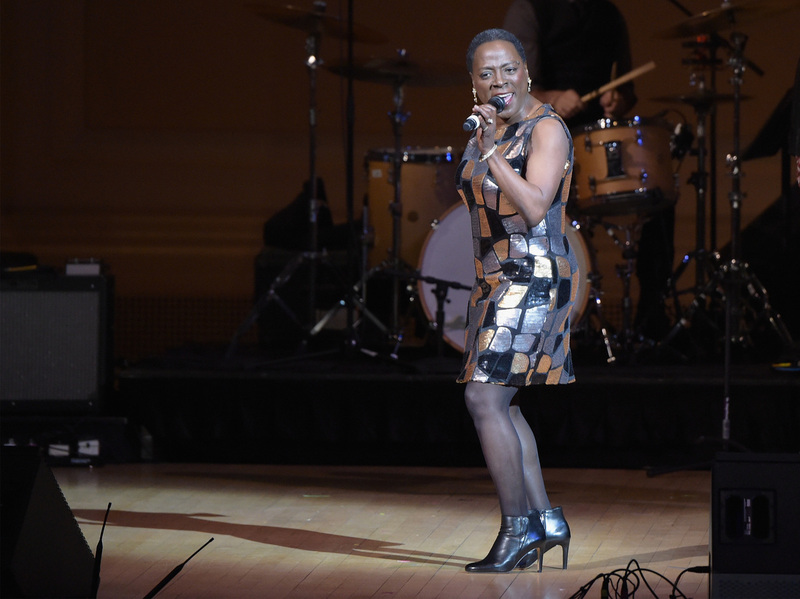 Sharon Jones, seen here performing at Carnegie Hall in February, died last week at the age of 60. Jones, who passed away last week after a long, public battle with pancreatic cancer, enjoyed one of the great second acts of American pop music history, one whose countless retellings never seems to diminish its wonder. She was born in Augusta, Ga., in the mid-1950s, which made her just a little too young to have made a go at a soul career in the heyday of the 1960s and early '70s. The closest she got was at age 17, singing backup on tour with Long Island R&B girl group The Magic Touch. Fast forward 20 years and Jones was working as a corrections officer out of Rikers Island prison while moonlighting as a wedding singer on the weekends. Back then, Jones was dating a saxophonist associated with New York's Desco Records, a short-lived but influential label specializing in vintage-sounding gutbucket funk singles. Desco's co-founder and engineer, Gabriel Roth, tinkered with perfecting that throwback affectation, but they still needed a singer who could nail the proper vocal vibe. Enter Sharon Jones. In hindsight, it's easy to romanticize this chance encounter between Roth and Jones as fate, but the eventual magic they'd create took a while to fully develop. Somewhere in my crates, I have a few of those early Desco sides, many of which were pitch-perfect, retro-funk fare, but as much as I enjoyed those records, at times, they could sound more like attempts at stylistic replication than forging a distinctively original signature. I have an email from that era where I described Jones and her band as "another James Brown satellite." But then Desco folded and Daptone Records arose from the ashes, with Jones and the Dap-Kings forming the new label's centerpiece. The group's first album, 2002's Dap-Dippin' With..., was recorded in between the two labels and carried much of the Desco style with it, but their next effort, 2004's Naturally, suggested a new direction, especially for Jones. On songs like the album's lush, closing ballad, "All Over Again, she emoted with a different kind of urgency, one based around a quiet intensity of feeling rather than just lung-busting power. The thing is, as much as Jones was compared to the likes of such funk-era stars as Lyn Collins or Marva Whitney, her voice took on new texture and dimension when she played with earlier, blues-influenced styles, a la Lavern Baker or Ruby Johnson. She gradually mastered how to exert a hefty presence through small, inflective touches; I especially loved when she would end a line with a doo-wop curl into a higher register. By the second and third times I saw Jones and the Dap-Kings perform, it was clear that their work was paying figurative and literal dividends: They sold out Los Angeles's El Rey Theater in December 2007, and by next summer they were headlining the Hollywood Bowl to a crowd that was roughly 50 times the size of the Elbo Room's. Touring behind what was arguably the group's best album, 100 Days, 100 Nights, Jones was in the spotlight like never before, though she had a little help from an up-and-coming pop-soul singer out of London's Southgate neighborhood: Amy Winehouse. When producer Mark Ronson began working with Winehouse on what would become her renowned sophomore album, 2006's Back to Black, he enlisted the Dap-Kings as both session players and a tour band. As Back to Black began to blow up with its own notably retro-soul groove, comparisons between Winehouse and Jones were inevitable, especially as the former's burgeoning stardom seemed to follow an all-too-familiar pattern of white singers finding greater success with styles initially associated with black innovators. As Jones herself told me in a 2007 interview, "we've been out here for the last 11 years and we went to London and there was a craze about it. We started this thing. A lot of them have heard us over the years and now they want it." Without taking away from Winehouse's own unique style, it's undeniable that Back to Black's sound borrowed heavily from the Dap-Kings', but in return, as Winehouse's prominence grew, it compelled many to discover and champion Jones and the band. It's remarkable to realize how much Jones and the Dap-Kings helped influence the broad pop landscape, coming out of that moment. Established acts like Solange Knowles and Raphael Saadiq began dabbling in various retro-soul offerings, but more substantially, an entire cadre of independent label soul artists arose alongside the Dap-Kings. That included other, older soul survivors such as Lee Fields, Charles Bradley and Nicole Willis, but also younger artists including Lady, Mayer Hawthorne, Myron & E, and Nick Waterhouse. Jones and the Dap-Kings weren't the sole reason behind this explosion, but they were undeniably one of the most productive engines powering it. In 2013, as the band was supposed to be recording their fifth original full length (Give The People What They Want), Jones was diagnosed with what eventually was identified as pancreatic cancer. She immediately went into treatment and that experience and its impact on her career and the band is documented in Miss Sharon Jones, a documentary released earlier this summer. Some of the most powerful scenes show Jones rocking a post-chemo bald head and storming the stage with an unexpected ferocity despite her weakened condition. Miss Sharon Jones ended production when her cancer had gone into remission, but when the film first premiered a year ago, she disclosed that it had returned, more aggressive than ever. She returned to treatment, but still attempted to maintain an active touring schedule. The last time I spoke to her was for an interview in July of this year, and when I asked how she mustered the energy to still perform, she said "right before I get on that stage, it's like something comes over me and the pain goes away. I guess the adrenaline just gets going and your body's just like, 'Well, here we go!'" Hearing about Jones's death on Friday felt like yet another cruel blow in a year already brimming with unimaginable musical loss. But I immediately thought back to all her past performances, especially that first time, commanding the Elbo Room. Her vitality was enthralling, and much as I mourned her passing, I spent far more time dwelling on how remarkable her life was. Starting at age 40, she began to realize the dream of every kid who ever saw a mic and thought "One day..." She went on to forge a 20-year career of incomparable performances and influential recordings that'd be the envy of any artist out there. And in those final, difficult years, her dedication to her band and fans, her ineffable presence on stage, reminded me that there is still a beauty and grace in this world that even the specter of death cannot diminish. An earlier version of this story incorrectly stated Sharon Jones was born in Savannah, Ga. She was actually born in Augusta, Ga.